Welcome to the No Bake Jolly Bar Blog Hop hosted by Fat Quarter Shop! I was delighted when I was asked to participate - can you tell why? This pattern is so easy to make and perfect for Fat Quarter Shop's Jolly Bars. 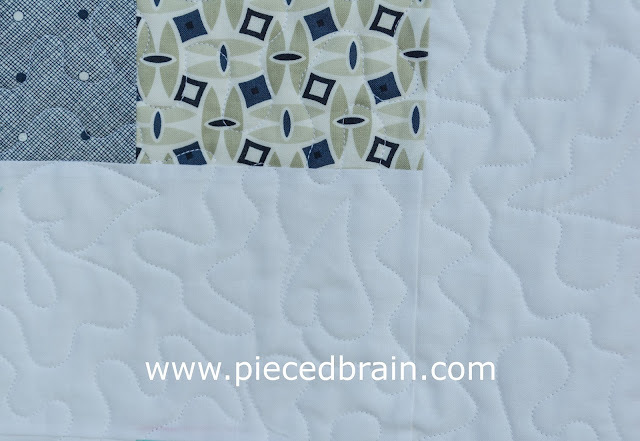 These precut rectangles are so easy to use - click here to see my first quilt made with them. I chose the Daysail Jolly Bar by Bonnie and Camille for Moda. What a fun fabric line! The pattern takes 2 Jolly Bars (although there was enough left for a crib size quilt which I will show you soon). The white fabric is Bella Solids White #98 - super crisp white. I used Aurifil 50 wt for precise piecing. This quilt is special for many reasons, but most of all because it was the first project I quilted using a long-arm machine! So scary after quilting everything with my Bernina. To get used to it I quilted meandering with hearts here and there. I plugged along and was done in 4 hours! My shoulders and wrists were very happy with the change in equipment!!! After holding the quilt for me so I could photograph it my youngest son, Ryan, rolled it up and decided it was his advanced Christmas gift! Not so fast, boy! 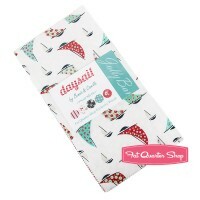 Now, for the giveaway: Fat Quarter Shop is giving away a Jolly Bar of your choice! Just leave me a comment letting me know how you would use a nice package of precut rectangles in your projects. If you follow me, leave me an extra comment for another chance to win. This giveaway is open to all of you, regardless of where you live. Make sure I have a way to contact you, should you be the lucky recipient. This giveaway is open until Sunday the 6th and the winner will be announced on Monday, December 7. I am fond of the quilts my grandmother made. She almost exclusively made one-patch quilts. I would take that package of precuts and make one like the ones she made for her grandchildren. 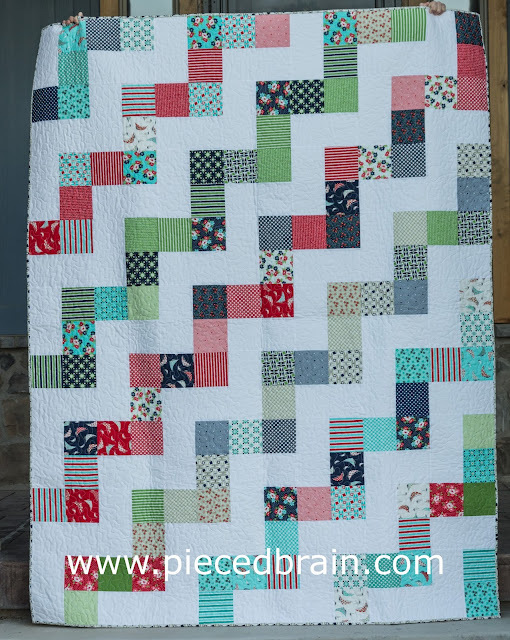 I love nine patch quils and log cabins - and this free pattern! I cant decide!! But I would love to do one in holiday fabrics - Jingle would be great! I follow your blog on Bloglovn! have a great weekend! I'd make a small lap quilt to cozy up with on the couch at night. Happy Friday! I'm a follower through Bloglovin. Yeah! I love the pattern that you used at the top of your post....simple, but it uses the precuts perfectly. Thanks so much! And I'm a long time follower. Thanks! These will make easy flying geese. Would make a great coin quilt or rail fence...love your quilt! I think I would make a quilted beach tote as I heading to Florida for new year. I'd make the quilt with Christmas fabrics! Great pattern. I am your follower on Bloglovin. Lovin all that you share. I'm not sure what pattern I would use, but am sure I will make a wonderful quilt. I have been happily following with GFC. Estou precisando de almofadas,sofá novo depois de 37 anos...Mas não joguei fora o meu velho,fiquei com pena.A reforma não compensava...está na varanda agora.beijo graaaaaannnde!! I've been wanting to make a chevron quilt for a long time. A jolly bar would work perfectly, and I have had my eye on Daysail for a while now. Ooh, a coin quilt! I haven't actually made one yet! I think a quilt just with different sized flying geese would look great! I really like this pattern, but could also use the rectangles to make an easy rail fence quilt. I follow you by email. I would use it for a table runner - a quick gift I could get made in time for the holidays! Many thanks for the chance! I follow you by email. Many thanks! A (coordinated) scrappy 4 patch would be my choice for a new throw for my sofa. My cat has taken over the one I have there now! I am following you on Pinterest. This pattern looks like a good, quick project quilt. The Jingle line by Kate Spain would make a wonderful quilt to display at this time of year. Thanks for a chance in the giveaway. Beautiful quilt! I love these shortcut patterns and products for when you need a quick project. I haven't tried a jolly bar yet. Thanks! Of course I'd find a way to use some precut rectangles. Would be a fun challenge. I follow Pieced Brain by emails to my inbox and am glad I do! Jolly Bars are so cute :) I love doing four, nine and 12 patches. I think that would work great! I follow PIeced Brain by email! There are so many things I could make with a Jolly Bar! I would probably try the pattern that is included with each 1 first though. I follow Pieced Brain via email. Great quilt! I love it in Daysail. I would use a Jolly Bar to make a No Bake quilt. Your quilt is so cute in Daysail. I would love to use the Hello Darling Jolly Bar either in this pattern or one of the other Jolly Bar patterns. I would love to make a quilt using this pattern and jingle fabric. Thanks for the giveaway. I have grandchild #12 on the way, so would be a quilt for this baby. Your quilt is beautiful and I`d make a lap quilt and scarf.Thanks for the chance! I do follow your blog by email. I make this quilt, either a smaller version or with some matching solids added in. I haven't tried a jolly bar before so I'm not sure how I would use those rectangles -- but I would be happy to win and have to figure something out! I follow your blog via GFC. Beautiful! I love B&C fabric! I think that I would try my hand a a log cabin quilt, No Bake Jolly Bar quilt, or a quilt by Me & My Sister that is similar to this one called Pigtails and braids (I think). Thank you for the chance. I follow you via Bloglovin. Oooh decisions decisions!! I think it would have to be a nine patch or maybe some lovely long triangles- you could have a lot of fun with those couldn't you! I am one who loves to make table runners, these would work great. I follow you by email. Thanks for the fun. HAPPY TO FOLLOW YOU ON BLOG LOVIN'! HI,REALLY LIKE YOUR PROJECT>I'D LIKE TO MAKE ONE IN "AMBLESIDE" LIKE IT! THANKS TO YOU+FQS FOR SHARING A NEAT GIVEAWAY! I'd love to mix with some solids, to make squares. I'd use a Jolly Bar to make this exact quilt, but maybe use a darker solid for the background. I would make a lap quilt in this pattern - it's lovely! Thanks for the chance to win! I would love to make a quilt just like yours...and congrats on your new long arm work. Your quilt turned out great! I am a follower via email. There are quite a few quilt options to use with them. And ps- your son is hilarious. I love it! I do love how this quilt looks. I think I might give it a try! I follow you on Pinterest. I would make a quilt for a dear friend who has 2 sons and could use something really pretty just for herself. I am new to Jolly Bars but, looking at the patterns on FQS website, I especially like the pattern you chose. I thk it would make a great Christmas quilt with Jingle or a nice snuggle qult with Prairie. Thanks for the oppportunity to win!! I would make a quilt in that very pattern! I think I would try the free pattern. I would make a throw quilt, possibly using this pattern. Thanks for sharing and for the giveaway. I love your no bake pattern! I definitely would give it a spin and then I also think something brick like would be cool. I would use this in the no bake pattern! It looks fun and easy, and I love the results! Thanks for sharing this. I follow you via Bloglovin. Thanks for all the inspiration! Love this quilt pattern...almost looks like something I could handle!! Thx my friend!! These make wonderful lap quilts. Although I love the patterns included in the bars. What a lovely colourful quilts. Well done on your first longarmed quilt - it looks great. I'm new to it and it's such a revelation how easy it is on your body!! If I won the giveaway I would make a chevron quilt with the rectangles. Many thanks. I'd use this same pattern! I would make some new pillows with the Jolly Bars! I agree with you, I too love this fabric line it is just so fresh and warm. The colors in the fabrics are crisp and bright. I am inspired by your long arm achievement. I would definitely sew the very same pattern you chose and made a delightful quilt for our church outreach program. Blessed holidays to you and yours. I would use a jolly bar to make this pattern--I like it! I follow you via email and enjoy your posts! Baby quilt for a friend! I get your emails and follow you. I'd use it in a quilt like yours....great job! Love Day Sail fabric! Great quilt.. so cheery. Did you buy a long arm machine? or rent one? I would give my baby boy a new blanket. Well, of course I would make this No Bake Jolly Bar quilt if I won your drawing! It's so fast & easy....I'm going to look through my stash this weekend to get a head start. I bet I can even make one by Christmas! YAY--thanks for the nice drawing. I really like the house quilt you made with a jolly bar and I like the half-rectangle triangle patterns I've started to see...not sure what I'd settle on in the end. What a great quilt. Love it! I would love to make one with different blues. I am a follower via bloglovin' and email. I love your quilt. I agree with your son. I want one also. I love the Daysail fabric. I would like to make one using the Daysail jolly bar. Thanks for sharing. Teddiechristine at Gmail dot com. I really like this quilt pattern. I would try to make that with my Jolly Bars! What a fresh, pretty quilt! I've never worked with precut rectangles before. I think it would be fun to make a big flying geese quilt with them. Thanks for the chance! sounds like your son is just like my daughter, if she gets the quilt in her hands it ends up walking out the door to her house.. but then I did the same thing to my mom so it must just be something all quilters children do..at least we know our work is appreciated.. I think I would use the pre cuts in a cuddle quilt for my grand daughter. Probably capy the quilt everyone made for the blog hop. It looks fun, bright and interesting. Thanks. I 'd like to make the quilt here that everyone has been doing! Such a pretty quilt! I am a novice quilter so I will stick to something very simple. A quilt for my grandson definitely. I'd probably make this quilt. THe pattern is quick and the result is wonderful. I would make s baby quilt or two. I need to make two for new babies arriving in the family in February and April. I follow your blog via email. I'd just love to sail off into a world of quilting! I am so glad you are taking the time to leave a comment. It is always nice to hear from you! Quilt pattern designer, lover of sewing, knitting, embroidery, crocheting, and writing with a Master's Degree in Instructional Design. Fantastic Sales! Click to Save! The links above and some of the links in my posts are affiliate links: if you click on the link and decide to purchase something, I may receive a commission. I often receive books from publishers so I can review them on my blog and, at times, I may receive products to use and write about my experience with them. 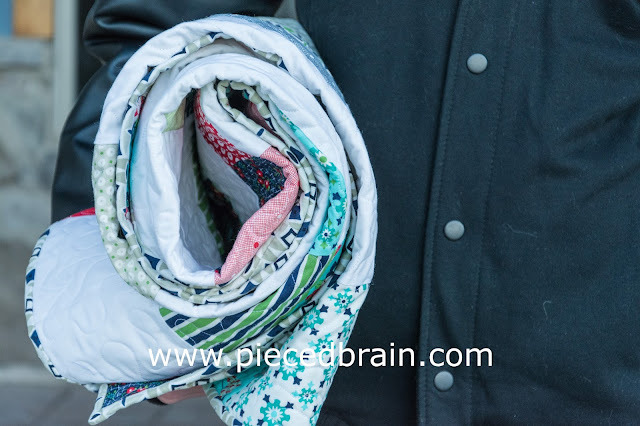 Visit Pieced Brain's profile on Pinterest. Pin It to your boards! Pieced Brain participates in the Amazon Services LLC Associates Program, an affiliate advertising program designed to allow sites to earn advertising fees by advertising and linking to amazon.com. HOWEVER, I only blog about things I love, have used, have read, and am happy with. Then, I link the posts to Amazon if applicable.